Management in the construction industry is a complex task, with team members often undertaking hazardous work, complying with stacks of regulations and legal requirements, and under the constant threat of plans going awry, however there is no need for all construction management textbooks to be so complicated. Also incorporated are important industry trends including sustainability, corporate social responsibility, and the advent of BIM. 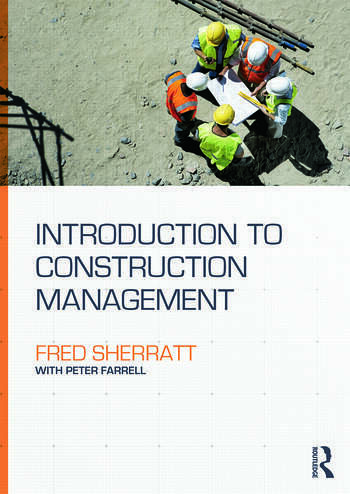 This is the most approachable text available for anyone starting to learn about construction management, at HNC/HND, FdSc, or BSc level. Fred Sherratt is Lecturer in Construction Management. She has over ten years’ experience in the construction industry, and worked her way up from the site secretary, through construction planning, to the position of construction manager for a large UK contractor. Peter Farrell is a Reader in Construction at the University of Bolton and also the programme leader for the MSc in Construction Management. He has delivered undergraduate and postgraduate modules in construction management and commercial management for over ten years. His industry training was in construction planning and quantity surveying and his post-qualification experience was working as a contractor’s site manager.